Jump start your weight-loss efforts with the power of Shape-Fast Ultra! Thermogenesis and appetite suppression are two important factors that can assist successful weight-loss. 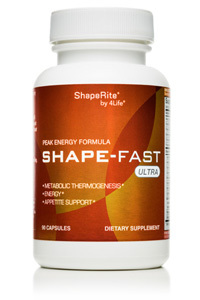 Shape-Fast Ultra combines a synergistic formula of ingredients that boldly provide both of these and more! To optimize results 4Life recommends that Shape-Fast Ultra be used in conjunction with a sensible diet and exercise program. ForsLean is a proprietary ingredient that has been patented for its use in promoting lean body mass. It is made up of the active compound Forskolin, which is known for its ability to stimulate healthy metabolic function and thermogenesis. Ginseng and chromium have both been shown to balance glucose levels, which can help diminish food cravings and unhealthy eating. Guarana, ginseng, chromium, green tea, and cocoa almond extract are included in Shape-Fast Ultra to help support energy levels and healthy stamina. I used to weigh 172 pounds and today I weigh 138. This product has everything that I need, with 4Life Transfer Factor and essential vitamins to support my body’s needs. Everyone that knows me knows about this product. I’m so happy. This product has helped me reach my ideal weight as I combine it with a sensible diet and exercise.